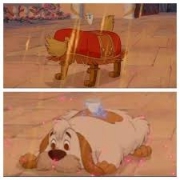 I worked in the Maurice unit on “Beauty and the Beast” under Directing Animator Ruben Aquino, and animated the enchanted footstool dog (Footsie) myself. Maurice was one of my first opportunities to animate a human character and it worked out well because he was quite a bit like a little critter. The footstool was another opportunity for me to shine and demonstrate how well I could bring a character to life. I did tons of research, shot my own reference footage, and thumb-nailed lots of actions from the footage. The goal is to learn the animal and character from the inside out. Learn all the anatomy and mechanics and personality of the character, then assume that role and draw the performance. 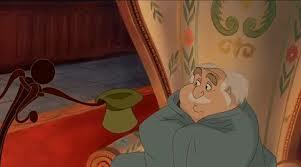 Animating the Footstool gave me a lot more confidence, which was huge at competitive Disney Feature Animation. I learned how to do very thorough research and action analysis. I use this skill all the time in researching my stone sculpture subjects. A huge knowledge of animal movement is a huge benefit in creating sculpture poses. Knowing where their bones are and what is going on inside their bodies is so important. I love furry little animals. I always thought about Footsie as both a little wiggly dog and a piece of furniture. Combining the two ideas created a fun way to think about the character. I carve a lot of furry little animals and I have that same fun feeling in sculpting them. “Alpine Harvest” and “White Lightning” are two of my stone sculptures that come to mind.